One of the main places that most people travelling to Alaska want to experience is Denali National Park, and rightly so. There are so many things to do in Denali National Park, and there is so much beauty. The home to the tallest mountain in North America, also named Denali (officially so since 2015), Denali National Park is a vast wilderness, six million acres with only one 92 mile mostly gravel road bisecting it. To protect the natural resources of the park, no private vehicles can enter the park past mile 15 and there are only a handful of established trails with hikers and campers encouraged to get out into the backcountry. It is one of the most wild and untouched national parks in the United States as well as the third largest. The diversity of landscape is visually stunning with taiga forest near the entrance of the park giving way to higher altitude sub-arctic tundra the further you travel in, with an abundance of wildlife such as grizzly bears, Dall sheep, marmots, foxes, caribou, wolves, moose and 160 species of bird. When I was researching about visiting Denali I found it hard to find information online. All of the accommodation options were geared towards campers or were well out of my budget. There didn’t seem to be any infrastructure for backpackers. Without a vehicle or a crap load of money, my options for visiting the park seemed limited. I was starting to think I wouldn’t be able to visit at all. But I don’t give up easily, I am stubborn like that. I persevered and after hours online I found somewhere to stay and read all the information about the park and getting around that I could find. I was still concerned about the hiking as there are only a handful of reasonably short trails within the park. With the park largely kept as an untouched wilderness, the whole point was to get off the beaten track and forge your own path in the backcountry. But I just wasn’t comfortable doing that. Not by myself anyway. But I booked four nights and hoped it would all work out. And it did. Once I was there everything came together. I met lots of people to hike with at my hostel as well as doing a couple of trails by myself, I spent a day on a shuttle travelling further into the park and even found time to do a few other free activities. I ended up loving my visit to Denali National Park and I want to make it easier for other budget travellers to go there too. So I decided to write this guide. You can access Denali National Park without having to pay for a shuttle up to mile 15 of the park road. This gives you a good feel for the park and you can jump off along the way to explore. There are a couple of great short hikes at Savage River, and if you are lucky like I was, you might even get up close and personal with a caribou. Pretty much all of the established trails in Denali National Park are in the entrance area which means you don’t need to pay for a shuttle to reach them. Check out the hiking section below for more details. If you have the time I definitely recommend getting to one of the thirty minute sled dog demonstrations. There are three per day in the summer season at 10am, 2pm and 4pm. You can catch the free shuttle from the Denali Visitors Centre forty minutes before the demonstrations begin which gives you time to walk around and pat the dogs and see the puppies before the demonstration begins. Alternatively you can walk the 1.5 miles along the Roadside trail to the Kennels. It’s pretty cool to see how excited the dogs get when they are being picked to pull the sled. They really love their job! The nearest ‘town’ to the park, Canyon Village has a few souvenir shops, galleries and restaurants and is fun to explore for an afternoon. There is also a small grocery store here, the Canyon Market, if you need to pick up a couple of items. You can reach the Village by walking the scenic mile or so along the Jonesville trail connecting to the Roadside trail. The Visitor Centre has some interesting displays, old photos and lots of information about the history as well as the flora and fauna of the park that is worth taking a look at. I recommend watching the 20 minute interpretive film ‘Across Time and Tundra’ that plays on a loop at the WAC. It explores the history of the park and the building of the park road. There is only a small number of hiking trails in and around the park as most of the park is backcountry wilderness. Along with a few short trails that link the WAC to the Denali Visitor Centre, the Sled Dog Kennels, and Canyon Village, there are also some solely scenic trails. I managed to do a number of them during my visit. A short (less than a mile one way) but very steep trail leading up to Thorofare Ridge from the Eelson Visitor Centre. With 1000 feet of elevation gain, this hike is tough going especially on a sunny day and I took a lot of short breaks to catch my breath. The views from the top were definitely worth it though. The trails passes wildflowers and curious ground squirrels along the way. At the top I walked to a point further along the ridge with even better views further into the park. The landscape in this part of the park is very stark and un-vegetated but very beautiful. The Savage River Loop is a gentle 2 mile loop hike taking you along one side of the Savage River and back along the other. It is a beautiful part of the park and if you are lucky you might see a caribou up close like I did. It starts at the Savage River day use area. This was my favourite hike in the park and the longest I did at 5.4 miles return. With 1700 feet of elevation gain it was also the most difficult but was worth it for the spectacular views of the surrounding mountains and valleys below. I ended up hiking an extra 2 miles return along a ridge to Healy Ridge which made it a more substantial 7.4 mile day hike. You can access the hike from mile 0.3 of the Taiga trail which begins at the Denali Visitor Centre, I wrote a more detailed post about the hike if you want to check it out. An easy 3.2 mile loop hike down and around a beautiful lake and along the Nenana river. A great hike to see beavers or at least their impressive dams, and to watch white water rafters on the river. This peaceful hike can be reached via the Taiga trail which begins at the Denali Visitors Centre. I had planned to do this hike but decided on Mount Healy instead. Triple Lakes is the longest trail in the park at 8.6 miles one way and goes through forested terrain with views of three lakes along the way. If you are staying at the hostel they can drop you at the park highway end of the hike so you can finish at the WAC, otherwise if you do it in reverse you will need to hitch back. I also planned on doing this hike when I visited Savage River but an onset of heavy rain thwarted my plans. It is a steep and strenuous 4 mile one way hike with 1200 feet of elevation gain, linking the Savage River day use area with the Savage River campground. You can take the free Savage River shuttle to and from either. Apparently it is easier to start from the campground. With car hire in Alaska starting at around $100 per day, it just isn’t an option for a solo traveller on a budget. Without a car you have a couple of options to get to the park. Most people will be travelling from Anchorage in the south or from Fairbanks in the north but I was coming from further south in Seward and there is only one way to get from Seward to Denali in one day: via the Park Connection Bus. The Park Connection Bus connects Kenai Fjords National Park from the city of Seward up to Denali National Park, with stops in Anchorage, Whittier and Talkeetna along the way. It was easy to book on their website, even the day before, and if you travel all the way from Seward to Denali, your ticket also includes a one hour pass to the excellent Anchorage Museum to be used during a lunchtime stopover in the city. I also used the Park Connection bus on the way back down south to Talkeetna then Anchorage and I found the service prompt and comfortable. Unfortunately the Park Connection Bus doesn’t have a stop in Carlo Creek so I got off at McKinley Village which is 6 miles away and my hostel picked me up in their courtesy shuttle. They also dropped me back there when I was departing to head south on the Park Connection bus. You will need to organise this with the hostel and they will let you know the times which line up within an hour of the bus arriving and departing. Alaska/Yukon Trails travels between Anchorage in the South to Fairbanks in the North, with stops along the way. I didn’t use them myself but I met a few travellers that did and they didn’t have any problems with them. Alaska/Yukon Trails also allows you to stop off somewhere along the Parks Highway and get back on at a later date for only a $10 re-boarding fee (I recommend a stop in Talkeetna). Alaska/Yukon Trails drops off and picks up at the Wilderness Access Centre at the park entrance. Alaska Bus Guy LLC is another bus service that connects Anchorage, Wasilla and Talkeetna to Denali National Park. I didn’t meet anyone that used this service so I can’t recommend or comment on it. The Alaska Railroad connects Seward to Fairbanks with stops in Girdwood, Anchorage, Wasilla, Talkeetna and Denali. This is a more expensive option than the bus services mentioned above but riding the railroad is a fantastic Alaskan experience. In saying that, the section between Seward and Anchorage is known to be the most scenic so if you were trying to choose which leg to take, do that one and take the bus to Denali. The Denali Train Depot is less than 100 yards from the Denali Visitor Centre. Unfortunately most of the options for staying in or near Denali National Park are too expensive for a solo budget traveller. Luckily there is one hostel, and it’s a really great one. Camping in Denali National Park is also a great budget option. 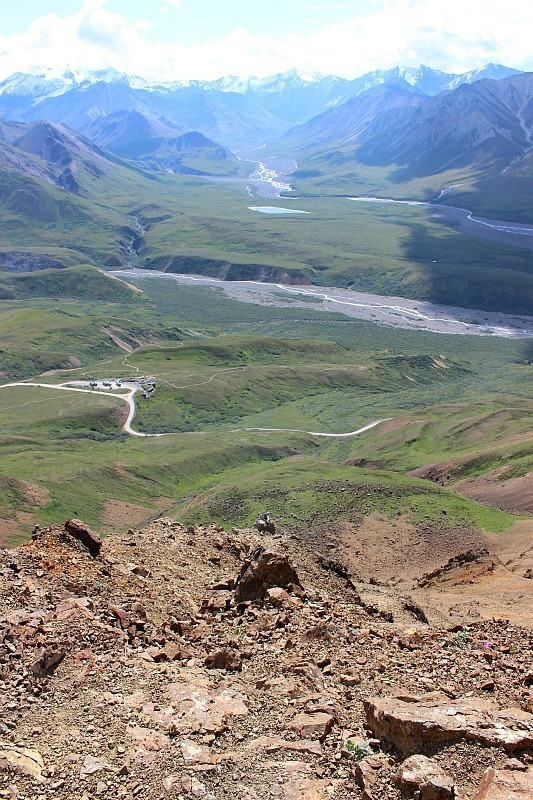 The Denali Hostel and Cabins is located 12 miles south of the park entrance in the small settlement of Carlo Creek. The hostel operates a free shuttle to the Wilderness Access Centre at the Park entrance, leaving at two times in the morning and coming back at two different times in the evening. There are dorm rooms (Co-ed, Women’s and Men’s) as well as wall tents with bedding, cabins and private rooms. With a kitted out communal kitchen, excellent free coffee, a fire pit with seating by the river, a cosy lounge area and even wifi, the hostel facilities are awesome. It has more of a Ski Lodge feel to it than a hostel. In the female dorm where I stayed, the bunks were large, handmade and wooden with private lights and lots of head space. One of the best hostels I have stayed in. Ever. Denali Grizzly Bear Resort is a bit closer to the park (six miles) and has some basic accommodation options with campsites starting at $28 and basic tent cabins for $39 per night. The facilities here sound a lot more basic than the hostel with coin operated showers and cooking shelters. I wasn’t sure how easy it would be to meet people if I was staying in my own tent cabin as there is no social area. You also have to pay extra to catch their shuttle to and from the park entrance. If the hostel was full then I definitely would have considered this as an option, but only then. If you are comfortable camping by yourself (I wasn’t) you can do so at six established campgrounds within the park. This is by far the cheapest option with campsites starting at $9 per night plus a reservation fee. Two of the camping grounds are within the first 15 miles of the park so are free to reach by the complimentary park shuttles with the other four being further in and reached by paid camper shuttles only. You can also camp in the backcountry of the park. This requires getting a permit and having pre-planned the route you are going to take as well as attending a safety talk. If you are not an experienced back-country camper, Denali is not the place to start, especially by yourself. From the Wilderness Access Centre (WAC) at the Park Entrance there are complimentary shuttles that travel to Savage River, the Riley Creek Campground, and the Sled Dog Demonstration. The Savage River Shuttle is two hours return and runs every two hours from 8.30am till 2.30pm from the WAC to the Savage River day use area. This shuttle travels to the furtherest point that you can get in to the park without paying for a park or guided shuttle and is a great option if you can’t afford any of the paid shuttles. I saw numerous caribou and a grizzly while riding to Savage River. The Riley Creek Campground Shuttle links all of the places of interest in the park entrance area including the Wilderness Access Center, Denali Visitor Center, Murie Science and Learning Center, Riley Creek Mercantile, and the Horseshoe Lake/Mt. Healy Trailhead. It runs approximately every 30 minutes. The Sled Dog Demonstration Shuttle departs from the Denali Visitor Center forty minutes before demonstrations begin which is three times a day in summer at 10am, 2pm and 4pm. You can catch the Riley Creek Campground Shuttle from the Wilderness Access Centre to reach the Visitor Centre or walk the one mile along the bike trail. As I mentioned above, you can only drive or take the complimentary park shuttles 15 miles into the park to Savage River. To access the park past mile 15, you have to book a shuttle bus or a tour bus. I was told by a few other travellers I met before getting to Denali to book the shuttle rather than a tour as it is much cheaper and you go to the same places. The main differences between the two is that on a tour you are not allowed to get off the bus other than short scheduled stops and that you have a registered guide telling you about the history of the park as well as the wildlife you see along the way. For the shuttles you can get off to hike along the way, catching the next shuttle that comes along (as long as it’s not full). If you are lucky you will get a shuttle driver that acts as a guide like I did but there is no guarantee as they are not required to do this. The shuttle drivers will generally stop to let you take photos if you see wildlife though, whether they act as guides or not. You also have stops at scenic viewpoints and other points of interest along the way. I chose to do the shuttle to the Eielson Visitor Centre located at mile 66 of the park as it takes eight hours to reach Eielson, have the half hour stop there then get back to the Wilderness Access Centre and that was more than enough time on a bus for me. It ended up being a10 hour day because I spent almost two hours at the Eielsen Visitor Centre as I wanted to do the short alpine trail from there. If you choose to go further into the park to Wonder Lake or Kantishna, you may not be able to get off the shuttle to catch the next one as it depends on whether there will be enough time. If a minimum eight hour day spent on a bus sounds like too much for you but you still want to see the park past mile 15 then you can book the shuttle to Toklat River at mile 53, which is six and a half hours return. I don’t regret not going further into the park or not doing an additional day on a different shuttle as most people I spoke to that did that said it wasn’t worth it and that they were exhausted. One ten hour day was enough for me. The shuttles and tour buses both leave from the WAC throughout the day and although it is recommended to book in advance, I showed up the morning of and got on a bus leaving an hour later. Tip: If you do want to travel further into the park to Wonder Lake (11 hours return) or Kantishna (13 hours return), you will likely need to book at least a day in advance as these buses leave very early and have limited departure times. My biggest tip of all if you are visiting Denali National Park is: Bring your own food! It’s fun to eat out but you don’t want to be doing it for every meal as food is expensive and there isn’t a proper supermarket anywhere near the park. Luckily I was told this before I went there and I brought loads of snacks, as well as ingredients to make breakfasts, packed lunches and a couple of dinners. The hostel kitchen had everything I needed to cook with and it was a fantastic way to keep costs down. I also ate out a couple of times and there are some great options for when you want to treat yourself. I loved this cool restaurant with loads of old photos on the wall as well as elaborate antler chandeliers. They have a huge selection of Alaskan craft beers on tap and the pizza was really good. I didn’t eat here but it was recommended to me by countless people. The Denali Salmon Bake unsurprisingly offers salmon dishes, as well dishes such as Elk sliders, halibut tacos and Buffalo burgers. I never got a chance to eat here but some of the girls in my room said the pizza was great and that it had a fun pub atmosphere later in the evening. Again, I never got the chance to eat here myself but a couple of my room mates raved about the massive cinnamon rolls here and I am kicking myself for not trying them. You can buy packed lunches and snacks at the WAC. I ended up buying a wrap for dinner there one night when we had to wait a couple of hours for our shuttle back to the hostel, as well as grabbing a danish and coffee for breakfast on my first morning. It’s not the cheapest but the quality isn’t too bad. If you are one of the lucky 30% that actually get to see the mountain during your visit (the summit is covered by cloud a lot of the time) you will get your first glimpse on the road or from the train on the way up, otherwise from mile nine onwards within the park. I was lucky enough to see it three times – on the drive up, from the Eielson shuttle and when I flew around it on a flightseeing tour from Talkeetna. I haven’t written about the myriad of paid activities within the park because I didn’t do any but you can go white water rafting, on small plane and helicopter tours, guided hikes and so much more. If you do decide to do a flightseeing tour, my advice is to wait to do it from Talkeetna if you are also passing through there. It is cheaper and there are more options. Get plenty of cash out as the closest ATM is in Healy, 12 miles north of the park entrance. If you get stuck at the park after the last shuttle (or if you get there just after the second to last one and have to wait four hours like me), you don’t have a lot of options for transport. There is one cab company that operates out of Healy but this option is expensive and you can be stuck waiting an hour or more for it to come. The company is called Caribou Cabs. Honestly, you are better to try hitching. There is free wifi at the Wilderness Access Centre. Really helpful if, like me, you don’t have a mobile plan in the US. The park entrance fee is $15 for seven days and is no longer included if you purchase tickets on any of the shuttle or tour buses. If you have a National Parks Annual Pass it will cover entrance to Denali, otherwise you can pay at the WAC. If you are catching a bus leaving Denali later in the day, you can catch the free hostel shuttle to the WAC in the morning and store your bag in one of the large lockers there, leaving you free to do an entrance area hike before catching your bus or train. By far the most expensive part of visiting Denali is getting there. The cost of the bus to and from Anchorage is $65 each way. This was for a bed in the Female dorm at Denali Mountain Morning Hostel and Cabins. The cost of a dorm bed is $37 per night plus 7% tax. I was hosted for one night by the hostel at their expense. This was for the Eielson Shuttle bus. Park Entrance is no longer included so that is an additional $15 if you don’t have a National Parks pass. This was for groceries and a couple of meals during my stay. My biggest splurge was a pizza and a beer at Prospectors Pizzeria which was $30 but fed me for two meals. Note: Prices may have increased as I visited in summer 2015. Definitely not cheap but a lot cheaper than it could have been. If I had come to and from Anchorage like most people do, this total would have been $366.50. Denali, like Alaska in general, is never going to be a cheap destination but there are always ways to cut costs. I hope my tips can help you do just that. Thanks to Denali Hostel and Cabins for the complimentary nights stay. All opinions expressed are my own. Beautiful photos and excellent advice! So awesome that you were able to see a caribou! That hostel looks really nice too. Wonderful tips, Katie! I look forward to visiting Denali someday and will definitely use your post to help plan our trip. Thank you for sharing! Thanks Alison, I hope you make it there!